It’s Monday morning in my fourth-grade classroom, always a busy time for returning and checking out books from the classroom library. “Who has Smile?” asks Suzie. “It’s not here. I think Kathy had it,” replies Kim as she digs through the graphic novels. “I gave it to Joey after I finished it on Thursday,” Kim responds indignantly. This scenario of “Where’s the book?” has been all too familiar in my classroom. My students are always excited about the number of books I have in my classroom. They will say things like, “Your classroom is like a library!” or “We don’t have to go to the library because you have so many books right here.” It is true, my class library is impressive. I love it, but it also takes a lot of work to organize and maintain it on a daily basis. With anywhere from 40 to 50 students on our team, it gets tricky to keep track of book circulation. I love having lots of books on hand and work very hard to keep a steady flow of new titles while weeding out older, outdated books. Like many teachers, I lose several books each year as students forget to return them, lose them, or destroy them. This is to be expected to some degree, but in recent years, it has happened a bit too much. 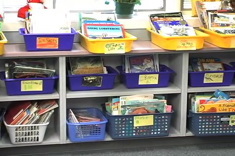 There are challenges that come from being a busy teacher with a large classroom library. The books need to be organized in some fashion and reshelved in the correct bin or on the right shelf so they can be found easily for the next person. I need to try to keep track of who has which books so I know whom to ask when I am looking for a particular title. 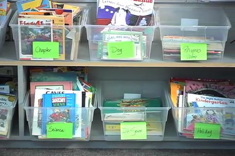 There are several things to consider when organizing a class library. Do you use bins or shelves? Organize by levels or genres? Put books alphabetically or just leave them in random order? Here is what has worked for me in recent years. I use a combination of bins and shelves. Bins hold books in a series or several by a particular author. The library is organized by genre, author, and some subcategories, which I share below. What did not work well was my system for checking out and returning books. In an attempt to keep track of circulation, I have spent way too much money and far too much time purchasing library pockets, writing titles on index cards, and putting them in the back of virtually every one of my books. The theory was that the students would take the card out of the book they were reading and put it on a pocket chart under their name or, in the past two years, behind their name in a recipe box. In theory, it was not a bad idea. But in reality, with 50 students using the library, many cards ended up on the floor, or they never made it back in the book. Or students didn’t take the card out of the book at all so we didn’t know where the book had gone when someone was looking for it. This year I reorganized and refreshed my library. I thought about how I could make the library easier for the students to use and for me to manage. Books in a series are placed in bins near their particular genre. Narrowing the topics has made it easier for all of us to locate books. These categories continue to evolve as the students and I think of ways to improve the organization of the library. To address my other problem of book checkout, I decided to try using an online app where I could enter my books into the site’s database so the students could check out books with an iPad. 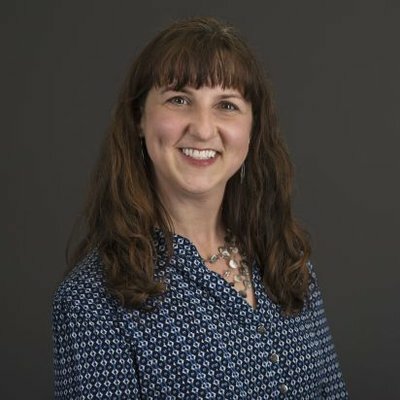 I wanted a site that was free, easy to use, and able to store all of my books. 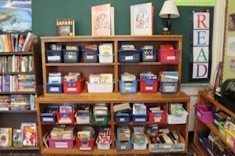 There are severaI to try, but I decided upon Classroom Organizer from Booksource. It was my hope that an online system would help me keep track of who had checked out which books. 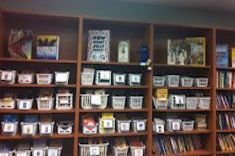 I was also interested in being able to look at the books each student had checked out as a peek into their reading lives. Other apps I looked at included Book Retriever, Intelliscanner and Book Buddy. The most challenging part was individu ally entering approximately 2,500 books into the database. To do this I enlisted the help of my students during the last three days of the school year. While other classes were having relay races and watching movies, mine was organizing the library and loving it! Armed with 10 borrowed iPads, and in teams of two, we scanned the books that could be scanned, and entered the rest by typing in titles. Our classroom looked like a construction zone, but I could never have taken on this task without their help. This year we started using the app to check out and return books, and it is working very well. At the beginning I was checking out books to students all day long. Now I make myself available every morning, snack time, and dismissal time for book checkout. To return books, students place a craft stick with their name on it inside the book and place it in the return bin. These are scanned later by a student or myself. If you teach one class and your library is manageable, I would not recommend using an online database. But if tracking your classroom library circulation is overwhelming because of the number of books and students, you might think about using an online app. Here are some things to consider as you look at different possibilities. Who will help you enter all of your books? If you teach grades 4 and up, the students could be very helpful. Younger students might not be the help you need. Parent volunteers and family might also be the way to go. I would recommend tackling this task at the beginning or end of the school year when all of your books are on the shelf. Does the app do what you want it to do? Some apps allow you to see your library by reading level or genre. Others allow you to quickly see if a book is checked out. Some come with a handheld scanner (for purchase) or allow you to see your most popular books. Will you have time to check out books during the day? You may want to limit check-out times during class. I tell my kids to just start reading the book and we can check it out to them later. If you train several responsible students to handle the checkout and return of the books, it will be very helpful to you, and they love doing it! 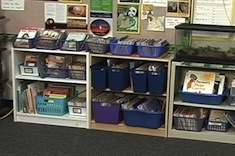 Having a large, well-organized classroom library is important for the reading development of the students. 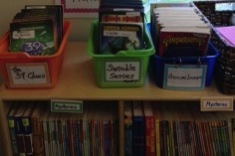 For the first time in a long while, I feel like the organization of our classroom library meets the needs of the students and my own need for a simple management system.